Neisseria meningitidis, gram-negative diplococci that cause meningococcal meningitis (magnified x 33000) (http://www.dailymail.co.uk/sciencetech/article-2197533/As-pretty-picture-lot-deadly--Killer-diseases-youve-seen-before.html). 2 What is bacterial meningitis? Neisseria meningitidis, a human-specific pathogen, is a gram-negative, aerobic, non endospore forming  diplococcus of the Proteobacteria phylum (see Figure 1). This nonmotile, yet piliated  bacterium is enveloped with a carbohydrate capsule  that is covered with and distinguished by the polysaccharides attached to its surface, and is targeted by the host's immune system. N.meningitidis is one of the three main bacteria that causes acute bacterial meningitis, along with Streptococcus pneumoniae and Haemophilus influenzae . Of the forms of acute bacterial meningitis, Neisseria meningitidis causes meningococcal meningitis, which is among the top 10 causes of death due to infection across the globe, where one-third to half of people who survive the infection deal with permanent physical or mental side effects of the disease . These side effects, also known as sequelae, can include chronic fatigue and insomnia, hearing loss and neurological disability, as well as loss of skin, fingers, toes, and sometimes limbs due to restricted blood supply to such tissues [2, 12]. In fact, these symptoms closely reflect those of individuals who experience post-traumatic stress disorder following survival of septicaemia and septic shock, which are conditions caused by the invasion of bacteria into the normally sterile environment of the bloodstream . Figure 2. Brain anatomy: a breakdown of the meninges. (https://s3.amazonaws.com/healthtap-public/ht-staging/user_answer/reference_image/6878/large/Meningitis.jpeg?1344938828). Bacterial meningitis involves the invasion of bacteria into the typically sterile environment of the bloodstream, followed by infiltration of the meninges, causing meningeal inflammation . In order to reach the bloodstream, the bacteria must first colonize the nasopharynx of the human host, and then cross the nasopharyngeal epithelium by attaching to non-ciliated epithelial cells by their pili  to undergo endocytosis . The meninges, a lining surrounding the central nervous system composed of the brain and spinal cord , includes the components: the pia, the arachnoid, and the subarachnoid space (Figure 2). Many cases of meningitis involve the spread of bacteria from an infection in a completely different part of the body by traveling through the bloodstream to the brain and spinal cord. However, bacteria have been also known to spread throughout the body from a significant blow to the head, or from an infection initially located in the ear, nose, or teeth . As a rapidly progressive disorder, meningococcal meningitis culminates in Neisseria meningitidis invading the subarachnoid space of the brain, causing inflammation of the meninges. Before the bacteria enter the subarachnoid space, their numbers increase significantly within the bloodstream while adapting to the normally sterile environment. In response to the bacterial infiltration of the bloodstream and the release of outer membrane vesicles containing the lipooligosaccharide (LOS, or "endotoxin") , which has been shown to be the most important bacterial factor in triggering the host immune response , attack of Neisseria meningitidis bacteria by white blood cells occurs. If their numbers are excessively elevated, N. meningitidis bacteria cross the blood-brain barrier and take over the subarachnoid space . Unfortunately, once the bacteria enter the subarachnoid space, the host's defense network is unable to control the infection developing in the cerebrospinal fluid (CSF) because the presence of safeguards, including local antibodies and complement activity (aids in combating the invading pathogens) is absent, or nearly nonexistent in the area. As the numbers of bacteria and white blood cells increase in the CSF, a local inflammatory response is induced in the subarachnoid space from the creation and release of inflammatory mediators. The presence of inflammatory mediators within the CSF increases the accessibility of the blood-brain barrier, a key ingredient to the bacterial meningitis infection. In response to the accessibility of a typically sterile environment to pathogens, these mediators (including liposaccharides and cytotoxin-engaging receptors, including what are called Toll-like receptors) of endothelial cells activate downstream cascades that release white-blood cell precursors and other immune cell responses. This allows for white blood cells, specifically neutrophils, as shown in Figure 3, to move across the blood-brain barrier . However, instead of aiding the host in combating the bacteria in the subarachnoid space, the mechanisms of the host's immune system actually damage the endothelial surface . Neutrophils, in particular, release a combination of inflammatory proteins, proteases, and other enzymes, causing the breakdown of host tissues . Neisseria meningitidis invades the meninges (http://www.qiagen.com/geneglobe/static/images/Pathways/Bacterial%20Meningitis.jpg). Although the host can show signs of symptoms such as confusion, stupor, coma, and seizures that correlate with bacterial meningitis, these conditions are not directly caused by bacterial invasion because the bacteria cannot invade the tissue located underneath the pia (gray matter and white matter, shown in Figure 2). Accessing the subpial tissue is a chemical response induced by proinflammatory cytokines, which are small signaling molecules that are released in response to the bacterial invasion and the breaking down of cells within the subarachnoid space (see Figure 3 for additional understanding). Neisseria meningitidis has the greatest outbreak potential of the three main bacteria causing acute bacterial meningitis, and regularly causes outbreaks in the "meningitis belt" of sub-Saharan Africa, where epidemics occur every 8-12 years, and can have a disease rate of greater than 1% . Though the majority of cases of meningococcal meningitis in the meningitis belt are caused by serogroup A (along with serogroups C and W), recently serogroup X meningitis (which was previously considered to be a rare form of the disease) outbreaks have occurred in Niger, Uganda, Kenya, Togo and Burkina Faso (2006-2010) . Unfortunately, no licensed vaccine has been discovered to combat the pathogenic effects of serogroup X meningococcal bacteria (MenX) . The relevance of the recent emergence of MenX is centers on the reality that the meningitis belt bears the brunt of meningococcal disease worldwide, where the area at risk for contracting the infection includes 21 countries populated by over 300 million people . South Africa was the first location in Africa documenting a case of MenX disease in 1974 . Since that time, there have been a number of reports involving MenX from various countries in Africa (Figure 4). However, Burkina Faso's population in 2010 has been exposed to the most significant MenX outbreak in history . By surveying ten districts in western Burkina Faso, a minimum of 120 cases per 100,000 people in as little as one district was reported seasonally . Interestingly enough, there have only been reports of sporadic cases of MenX disease confirmed outside of the meningitis belt. In a study of meningococcal isolates from 27 countries from between 1999 and 2006, 68 of 5056 isolates were discovered as MenX, with 35 of the isolates from the United Kingdom, 8 from Germany, followed by 7 from France . The increased incidence of MenX disease in the meningitis belt compared to other parts of the world suggests that there are general risk factors affecting all forms of meningococcal disease- not simply a higher prevalence of risk factors found only in the meningitis belt . As there are already vaccines used to combat serogroups A,C and W in the sub-Saharan meningitis belt of Africa, and there has been an increased prevalence and epidemic occurrence of MenX disease, the discovery of a vaccine to combat this upcoming disease would help complement, and improve the effectiveness of the other three vaccines frequently benefiting this area of the world . Figure 4. The meningitis belt of Sub-Saharan Africa and the countries with confirmed outbreaks of meningococcal disease by serogroup X meningococci  (http://www.sciencedirect.com/science/article/pii/S0264410X13004751). Though Neisseria meningitidis affects a large range of ages, it can be found most frequently in children and college-aged individuals . Children and young adults are especially at risk for contracting meningococcal meningitis, due the environments and social conditions they are exposed to . Particularly when looking at young adults, college students seem to be particularly at risk due to living in close quarters with many other individuals with diverse backgrounds, and where when stress levels rise and the amount of sleep decreases, so too does the susceptibility to infection. The immune system's ability to fight off infection may be due to a number of activities that college students engage in, including drinking, partying at clubs, and smoking (just to name a few). Unfortunately, every year, 15 to 20 college students die due to bacterial meningitis . And because there are varying symptoms for the disease, it is difficult to diagnose meningitis in the early stages of the infection . Symptoms vary from person to person, though adults and older children usually experience headache, vomiting, stiff neck, sensitivity to light, delirium and confusion, irritability and drowsiness, and in rare cases seizures or coma . Infants and young children are known to exhibit high-pitched whimpering and crying, problems with waking up and lethargy when awake, being fussy when held or cuddled, having a high fever and cold hands and feet, vomiting, having a pale or blotchy appearance, refusing food, and staring blankly at the surroundings . In general, Neisseria meningitidis is known to cause a distinctive rash due to the bacteria's excessive invasion of the bloodstream, which can be fatal. When the bacteria have increased to an excessive amount in the blood, they release toxins that cause the breakdown of blood vessel walls, creating a leakage of blood into the skin. The leaking of blood into the skin causes the emergence of a hemorrhagic rash that can be located anywhere on the body, from the eyes to in between the toes (see Figure 5) . This rash begins as what appear to be tiny spots on the skin, but if it is not treated, the spots can grow and result in many areas of bleeding, where the skin looks as if it was recently bruised. Figure 5. A rash developed from contraction of meningococcal meningitis (http://www.vaccineinformation.org/menin/photos.asp). In terms of case severity, the side effects of meningococcal meningitidis, including sepsis, which occurs when an infection spreads throughout the whole body, and not just the blood, but also the organs, as well as hypotension, the condition of having abnormally low blood pressure, are actually more severe than the disease itself . Figure 6. The distribution of meningococcal meningitis outbreaks caused by serogroups A, B,and C, the most common causes of the disease (http://www.pharmainfo.net/reviews/comprehensive-review-meningococcal-meningitis). N. meningitidis has 12 serogroups, or forms distinguished by possessing a particular set of antigens on their cell membrane, or capsular surface. Antigens are important in their promotion of an immune response. These 12 strains of N.meningitidis are distinguished by the polysaccharide present on the bacterial capsid . Most cases of meningitis are caused by the following 6 serogroups: A, B, C, W135, X, and Y, but serogroups A, B, and C are by far the most common causes of the disease (shown in Figure 6) [6, 13]. Epidemics are found to be mainly associated with serogroup A meningococci, with the highest prevalence of the disease occurring in late winter and early spring . Rampant epidemics have been discovered in a diverse collection of locations across the globe, including Brazil, North America, Finland, Nepal, and Saudi Arabia . However, there have also been outbreaks correlated with serogroup C, and most recently, within the past decade, serogroups W135 and X .
Serogroup B infection is the most common form of the disease in countries across Europe and North America . The problem with fighting infection caused by serogroup B N. meningitidis is the similarity of its capsular polysaccharide structure and polysialic acid to glycopeptides that make up human brain tissue, as the similarity causes immunogenic tolerance to its capsid . Compared to the tendency of serogroup A to cause large-scale epidemics, serogroup B causes sporadic and isolated outbreaks of meningococcal meningitis . Incidences of serogroup B infection have been found in Oregon, Cuba, and Norway . Serogroup C and serogroup B are found most commonly to cause meningococcal meningitis in adolescents and adults in Canada, the United States, and Europe. N. meningitidis serogroups B and C express capsules composed of polysialic acid or sialic acid that are linked to glucose or galactose [10,13]. Serogroup A has capsules composed of N-acetyl mannosamine-1-phosphate . About 1 in every 10 people carries a harmless form of meningococcus in their throat and nose. During a meningitis outbreak, approximately 95% of people will carry meningococcus, though fortunately many are resistant to its' deadly throes, with only 1% of the population contracting the disease . In order for the bacteria to be transferred, if someone with the disease transfers their respiratory fluids through kissing, or the sharing of a drink, sneezing, or coughing , then it is very likely the disease will be contracted. However, fortunately N. meningitidis cannot live outside of a human host for an extended period of time, so it cannot be contracted by exposure to a water supply, a swimming pool, or an air-conditioning system . Diagnosing acute bacterial meningitis involves isolating the bacteria from sterile body fluid. This involves performing a lumbar puncture, also known as spinal tap. In this procedure, a needle is placed through the lower back and into the spinal cord, where cerebrospinal fluid (CSF) is collected to determine if the meninges are truly inflamed as a result of bacterial meningitis . This determination is verified by observing the CSF under a microscope to look for the presence of bacteria . Individuals that are not infected with meningococcal meningitis have samples of CSF containing known percentages of glucose and protein . Those subjects infected with N. meningitidis have lower percentages of glucose in their CSF, as it metabolized by the bacteria . Additionally, the presence of white blood cells in the CSF can indicate infection by meningococcal meningitis, as uninfected CSF should not contain cells whose purpose is to fight infection . Because of the severity of the disease upon its onset, it needs to be treated as soon as possible with antibiotics. In a review of autopsy data, many deaths caused by N. meningitidis occurred within 12-24 hours of initially experiencing symptoms. After treatment with antibiotics, inflammation occurs because of the breakdown of the infection-causing bacteria. To treat the inflammatory response, administration of corticosteroids can help to decrease the amount of swelling occurring the brain and the resultant increased pressure within the skull . Unfortunately, the diversity of global patterns of meningococcal disease is greater because of the higher likelihood of an epidemic occurring. For those that survive the disease, they are fortunate in that Neisseria meningitidis has a lower risks associated with its contraction than the other two bacteria that cause acute bacterial meningitis (Streptococcus pneuomoniae and Haemophilus influenzae). When looking at cases of meningococcal meningitis across the globe, Africa records the highest incidence of the disease with greater than 100 endemic cases (where the disease is only found in a particular location or region) and greater than 1000 epidemic cases (when there is an outbreak of a new disease that affects an abnormally large amount of the population) per 100,000 people in a population per year. The lowest incidence region is Europe with 1-2 endemic and 2-10 epidemic cases per 100,000 people per year. Fortunately, no deaths have been reported (2012), but in terms of morbidity, 7% of survivors experience major long-term sequelae. With the mortality rate remaining relatively high despite advances in treatment of acute bacterial meningitis, there are several issues that complicate the medical community’s ability to diagnose and treat the disease. Because meningococci can easily circumvent the body's response to the infection by the exchange of genetic material, there has been concern that meningococci are able to replace their usual serotypes in response to a conjugate vaccination, particularly where a significant proportion of the population has contracted the disease, making it easily transferrable [1,4]. Conjugate vaccines have been introduced in order to induce long-term memory in the host as an improvement to the antigens of capsule-based vaccines, that despite displaying protective antibody activity, lose their effectiveness over time . The amount of protection time that is given by a vaccine, as well as a vaccine's ability to create immunity to an infection, or particular antibodies, while an individual is exposed to it, has created controversy in the treatment of acute bacterial meningitis . There has been a lot of discussion regarding the need for additional booster doses for conjugate meningococcal vaccines, as their has been evidence that serogroup B antibody concentrations decrease significantly for children provided their first dose at, and after 1 year of being vaccinated . According to D. Van De Beek and colleagues, there are two particular issues regarding the treatment of bacterial meningitis [3,8]. One of the issues involves ensuring that the delivery of the particular drug is as effective as possible in terms of cost, the amount of material required to manufacture the drug, as well as the drug's reactivity. Secondly, the effectiveness of the antibiotics administered to a given patient is very important. The given antibiotic must penetrate the blood-brain barrier in order for the treatment to be considered successful. This administration is according to how much the blood-brain barrier was disrupted by inflammation, as well as the drug's size, charge, interaction with the membrane, ability to bind with proteins, and its interaction with pumps that move material outside the body [3,8]. The clinical effectiveness of the antibiotic is furthermore dependent upon the antibiotic cerebrospinal fluid concentration and its ability to combat the bacteria that caused the infection. Furthermore, the antibiotics require a proper amount of time to eradicate all of the bacteria that caused the infection and to prevent the disease from recurring [3,8]. However, it is hard to predict the timescale to use, depending on the bacteria causing the disease (as mentioned before, there are other bacteria besides Neisseria meningitidis that cause acute bacterial meningitis), how severe the disease is, in addition to the antimicrobial agent used. In high-income countries, many authorities recommend a minimum of 7 days of treatment for meningococcal meningitis. Designing protein-based meningococcal vaccines is difficult due to the increased amount of genetic and antigenic diversity of Neisseria meningitidis. Because this bacterium is readily able to allow for genetic transformation and recombination, it has a variable population structure that reflects its accumulated mutations and horizontal genetic exchange. Therefore, there is a lot of variability in terms of the virulence of the meningococci, and thus there needs to be a vaccine that allows for complete coverage of both “hyperinvasive” bacterial lineages, as well as those bacteria who are commensalists . The "go-to" drug used to treat meningococcal meningitis is penicillin. Though penicillin is unable to cross the blood-brain barrier, it can penetrate the barrier when the meninges are acutely inflamed . For those who are allergic to penicillin, chloramphenicol or a third-generation cephalosporin can be taken. When preventing the spread of the infection, chemoprophylactic agents are used, with rifampin being the most popular option to date . Meningococcal meningitis can only be prevented by the administration of an immunization, so it is recommended for all individuals to get vaccinated, especially young adults . Unfortunately, there is not currently a universal vaccine that protects against serogroup B meningococcal meningitis, but the vaccine that treats the disease caused by the A, C, W-135, and Y strains is effective for 3 to 5 years . However, there have been locally effective vaccines used to combat serogroup B created in Cuba, Norway and New Zealand that are determined by strain-specific outer-membrane vesicle preparations, and have fortunately proved successful in reducing the amount of outbreaks. Additionally, there are several methods that are being tested to create a universal serogroup B vaccine, including further assessment of the genomic components of the particular serogroup, as well as the key components of the meningococcal bacteria that allow for its colonization and disease . "Bacterial Meningitis." Qiagen: Sample & Assay Technologies. 2013. Web. 22 Apr. 2013. 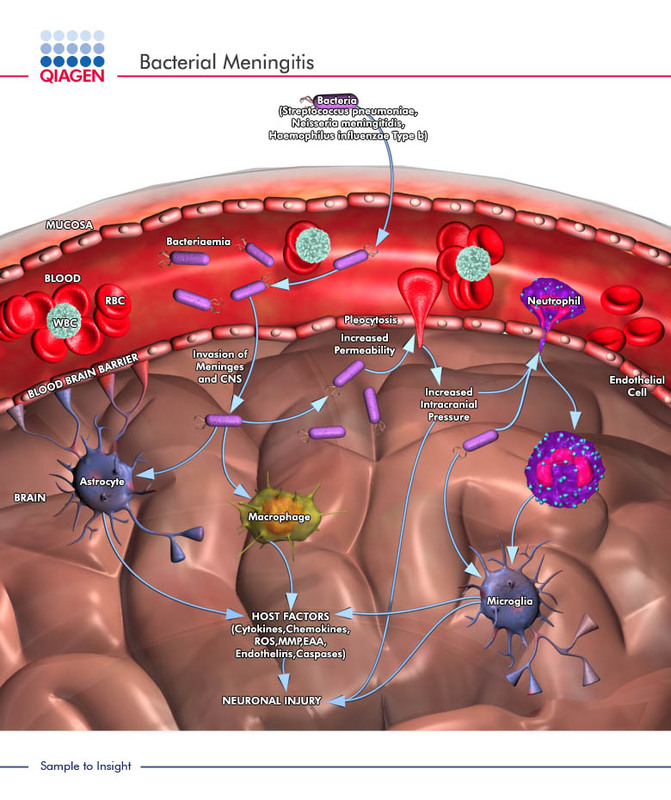 <http://www.qiagen.com/products/genes%20and%20pathways/Pathway%20Details.aspx?pwid=50>. Bertrand, Sophie, Francoise Carion, Rene Wintjens, Vanessa Mathys, and Raymond Vanhoof. "American Society for MicrobiologyAntimicrobial Agents and Chemotherapy." Evolutionary Changes in Antimicrobial Resistance of Invasive Neisseria Meningitidis Isolates in Belgium from 2000 to 2010: Increasing Prevalence of Penicillin Nonsusceptibility. Web. 22 Apr. 2013. <http://aac.asm.org/content/56/5/2268.full.pdf html>. Chaudhuri, A. "Adjunctive Dexamethasone Treatment in Acute Bacterial Meningitis." The Lancet Neurology 3.1 (2004): 54-62. Print. <http://www.sciencedirect.com/science/article/pii/S1474442203006239>. Feavers, Ian M., and Mariagrazia Pizza. "Meningococcal Protein Antigens and Vaccines." Elsevier (2009): B42-50. ScienceDirect. Web. 15 Apr. 2013. <http://www.sciencedirect.com/science/article/pii/S0264410X09006665>. Hill, Darryl J., Natalie J. Griffiths, Elena Borodina, and Mumtaz Virji. "Cellular and Molecular Biology of Neisseria Meningitidis Colonization and Invasive Disease." Clinical Science (2010): 547-64. Print. <http://www.ncbi.nlm.nih.gov/pmc/articles/PMC2830671/>. Johnson, Steven, Lionel Tan, Stijn Van Der Veen, Joseph Caesar, Elena Goicoechea De Jorge, Rachel J. Harding, Xilian Bai, Rachel M. Exley, Philip N. Ward, Nicola Ruivo, Kaushali Trivedi, Elspeth Cumber, Rhian Jones, Luke Newham, David Staunton, Rafael Ufret-Vicenty, Ray Borrow, Matthew C. Pickering, Susan M. Lea, and Christoph M. Tang. "Design and Evaluation of Meningococcal Vaccines through Structure-Based Modification of Host and Pathogen Molecules." PLOS Pathogens 8.10 (2012): 1-13. PLOS. Web. 16 Apr. 2013. <http://www.plospathogens.org/article/info%3Adoi%2F10.1371%2Fjournal.ppat.1002981>. McIntyre, Peter B., Katherine L. O'Brien, Brian Greenwood, and Diederik Van De Beek. "Effect of Vaccines on Bacterial Meningitis Worldwide." The Lancet 380 (2012): 1703-711. Print.<http://www.sciencedirect.com/science/article/pii/S0140673612611878>. "Meningococcal Meningitis." N.p., n.d. Web. 7 May 2013. <http://textbookofbacteriology.net/themicrobialworld/meningitis.html>. "Neisseria Meningitidis." Microbe Wiki. N.p., n.d. Web. 8 May 2013. <http://microbewiki.kenyon.edu/index.php/Neisseria_meningitidis>. "Neisseria Meningitidis." Wikipedia. Wikimedia Foundation, 22 Apr. 2013. Web. 22 Apr. 2013. <http://en.wikipedia.org/wiki/Neisseria_meningitidis>. Pathan, N. "Pathophysiology of Meningococcal Meningitis and Septicaemia." Archives of Disease in Childhood 88.7 (2003): 601-07. Print. <http://adc.bmj.com/content/88/7/601.full>. Peterson, D. C., G. Arakere, J. Vionnet, P. C. McCarthy, and W. F. Vann. "Characterization and Acceptor Preference of a Soluble Meningococcal Group C Polysialyltransferase." Journal of Bacteriology 193.7 (2011): 1576-582. Print. <http://jb.asm.org/content/193/7/1576.full>. "Pharmainfo.net." A Comprehensive Review on Meningococcal Meningitis. Web. 07 May 2013. <http://www.pharmainfo.net/reviews/comprehensive-review-meningococcal-meningitis>. "Progress and Challenges in Bacterial Meningitis." The Lancet 380 (2012): 1623-624. Web. 15 Apr. 2013. <http://www.sciencedirect.com/science/article/pii/S014067361261808X>. Van De Beek, Diederik, Matthijs C. Brouwer, Guy E. Thwaites, and Allan R. Tunkel. "Advances in Treatment of Bacterial Meningitis." The Lancet 380 (2012): 1693-702. 10 Nov. 2012. Web. 14 Apr. 2013. <http://www.sciencedirect.com/science/article/pii/S0140673612611866>. "What Are the Facts About Meningitis?" Meningitis Symptoms. Web. 13 Apr. 2013. <http://www.chacha.com/gallery/4869/what-are-the-facts-about-meningitis/46227>. Xie, Ouli, Andrew Pollard, Judith E. Mueller, and Gunnstein Norheim. "Emergence of Serogroup X Meningococcal Disease in Africa: Need for a Vaccine." Elsevier: Vaccine (2013): 1-10. Print. <http://www.sciencedirect.com/science/article/pii/S0264410X13004751>. Edited by student of Joan Slonczewski for BIOL 238 Microbiology, 2013, Kenyon College. This page was last edited on 10 May 2013, at 01:57.